In this lesson, we will learn how to use the properties of exponential decay to solve real-world and mathematical problems and to differentiate between types of decay. Determine whether the data shown exhibits growth or decay, stating whether it is linear or exponential. The production of a gold mine is decreasing with a rate of annually. 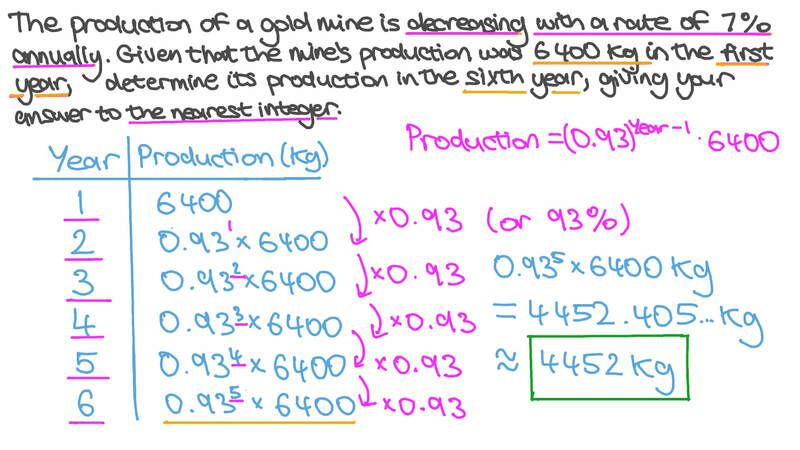 Given that the mine’s production was 6 400 kg in the first year, determine its production in the sixth year, giving your answer the nearest integer. The function 𝑦 = 𝐴 𝑏 𝑥 represents a 1 5 % decay in each period that 𝑥 measures. What is the value of 𝑏 ? Which of the functions below represents exponential decay? The value of a car depreciates by 8 % per year. A new car costs $ 2 0 , 0 0 0 . Write an expression for the car’s value in dollars when it is 𝑡 years old. The Asian elephant population 𝑡 years after the year 1900 is given by 𝑃 = 1 0 0 0 0 0 ⋅ 0 . 2 5 𝑡 / 1 0 0 . What was the Asian elephant population in 1900? According to this model, by what percentage has the Asian elephant population decreased over a century? A car was valued at $ 3 8 0 0 0 in the year 2,007. By 2,013, the value had depreciated to $ 1 1 0 0 0 . Assuming continuous depreciation at the same rate, find, to the nearest dollar, the value of the car in 2,017.